I’ve never owned a single Apple product but lately I’ve been wondering how good a real UNIX certified operating system might actually be. To get my feet wet, I decided to try out macOS Sierra in a VirtualBox session on a Linux host. I’m aware that much of the Apple experience is closely connected to the hardware, but personally I was more interested in the isolated OS experience. 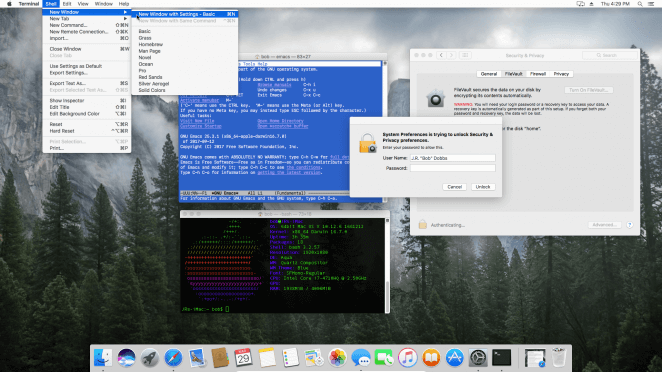 macOS Sierra running under VirtualBox on Arch Linux. For the record, running Apple software on non-Apple branded computers is not in agreement with the macOS software license. I’ll also add that the reason I’m not using the latest macOS High Sierra is due to abysmal performance under VirtualBox. The macOS installer is simple and intuitive, but the “Disk Utility” program gave me fits trying to locate my disk. Why you would not show the actual hard drive by default is beyond me. Playing peekaboo with Apple’s Disk Utility. Anyhow, it was refreshing to see that Apple respected my privacy and didn’t make a shameless play for my personal data. Enabling data collection and analytics is optional on macOS and you don’t have to sign up for an Apple ID. Well, you have the App store but on second thought I’ll be using that service strictly for system upgrades. Obviously a great deal of software is also readily available from vendors’ websites as dmg (disk image) files. I eventually discovered Homebrew, a free and open-source software package management system. Coming from a Linux environment, I found this approach to package management to be simple and effective. 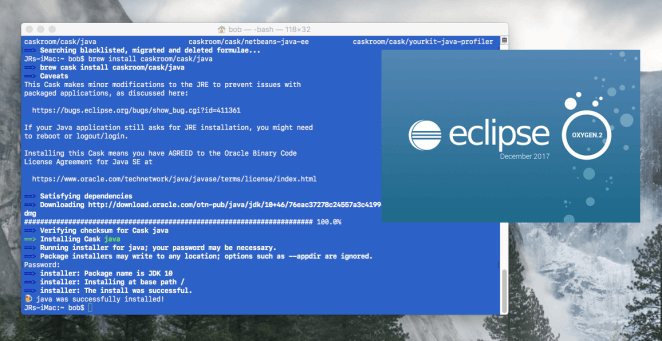 Installing Java and Eclipse for PHP developers with Brew. 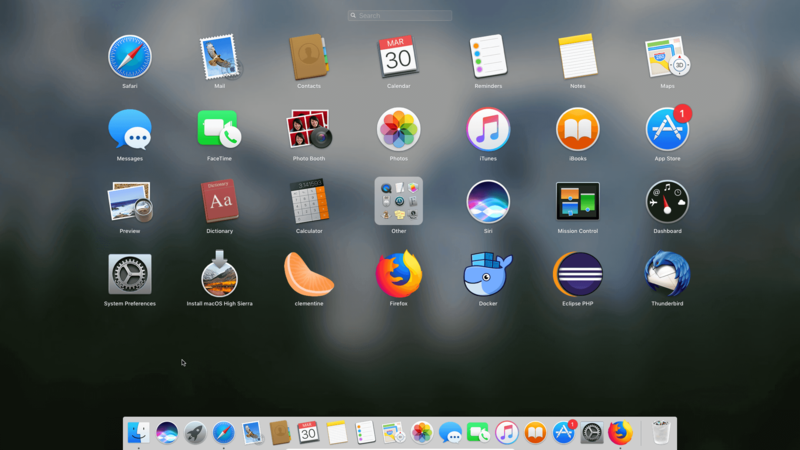 There are a few subtle (and less than subtle) differences between running UNIX and Linux based systems, but overall macOS Sierra feels pretty comfortable. I do spend a lot of time at the command line and after discovering Homebrew I got access to the few cli based tools I was missing. I do believe I could get most of my work done in this environment. Bask in the glory that is macOS Sierra. Apart from a few default applications I found to be substandard, my experience with macOS Sierra has been surprisingly positive. I find it to be a solid operating system providing a pleasant user experience. Unlike another proprietary operating system I could mention, it does not nag about cloud integration or slurp your personal data. Like Tim Cook (CEO of Apple) recently said: “The customer is not Apple’s product”. What I’m left wondering after running macOS Sierra is why “The Year of the Linux Desktop” never happened. If Sierra was a GNU/Linux distribution I would give it a decent rating, but in my opinion it does not compare favorably to many GNU/Linux distributions. Anyhow, I guess those Apple-branded computers might play a part in that equation. What I ultimately learned from this experience and from Apple’s latest stand on user privacy is that I might actually own an Apple product at some point in the future. I find Apple’s usage restrictions hard to stomach, but as far as proprietary operating systems go, they are suddenly looking better than the competition. When I began writing this review there had been 921 days since the last stable Slackware release. The apparent dormant state of development raised a few questions about the health of the distribution, but as usual the rumors of Slackware's decline was greatly exaggerated. The following review is based on the Slackware 14.2 release candidates. Slackware 14.2 x86_64 has been installed and reviewed on a Asus ROG G771JM.